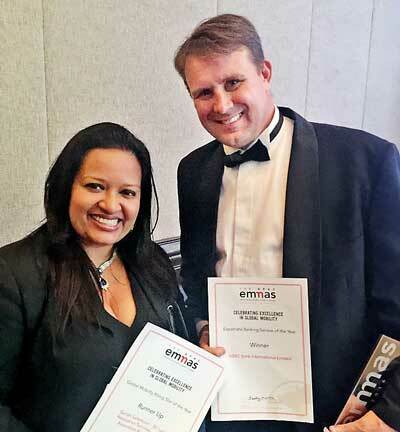 Founder of A. S. & Associates Resource also known as EVisaLaw and Sri Lanka Relocation Services Sarrah Sammoon won second place in the prestigious international Expatriate Management and Mobility Award (EMMA) award at a ceremony held in Singapore last week making it Sri Lanka’s first win in the International Global Mobility Industry. EVisaLaw and Sri Lanka Relocation Services is Sri Lanka’s pioneering company to be recognised in the international global mobility industry for providing immigration compliance and relocation services to corporate expatriates. “Having achieved runner up in this prestigious EMMA awards highlights that Sri Lanka can meet international standards in a competitive industry with our expertise. Being recognised as a Global Mobility Rising Star of the Year in the Asian Region finally indicates our effort to meet the needs of our clients who are investing in Sri Lanka. Having Sri Lanka up on this award list itself is humbling,” Sammoon said. Celebrating excellence in global mobility worldwide, the EMMAs take place in three regions throughout the year (Americas, APAC & EMEA). The Global Mobility Rising Star of the Year award is open to individuals from either a service provider or Corporate HR backgrounds who are in their first five years of working in the Global Mobility Industry but have been working in the industry for at least a year. They are regarded for having made a significant impact in the early years of their career, clearly showing exceptional abilities and be destined to be decision-makers in our industry for the future. The judges looked for evidence of excellent customer service and outstanding achievements with regard to such features as quality of service delivery, innovation and knowledge. For over 24 years, A. S. & Associates Resource Co has provided immigration and compliance services in Sri Lanka for corporates to over 186 destinations. In 2009 the company launched Sri Lanka Relocation Services to provide market entry, compliance, immigration, advisory and destination services for expatriates and the global community for short and long-term assignments and business travellers investing in Sri Lanka.